Have you ever wanted to take on the Cybermen or Daleks? 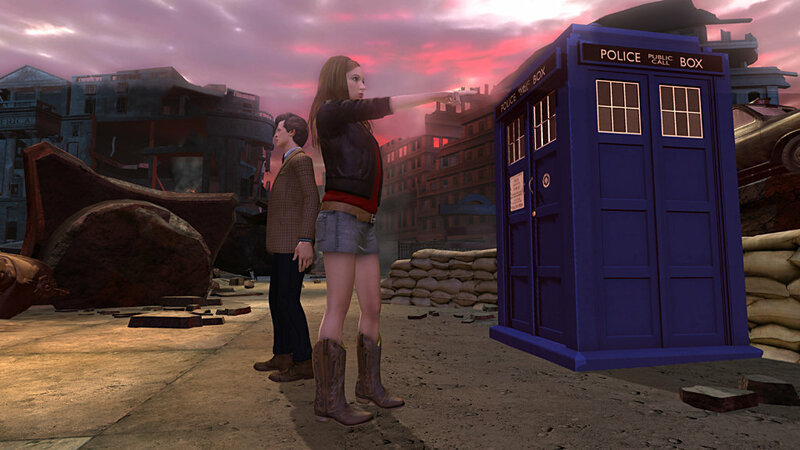 This is your chance to play as the Doctor for the very first time, but don't worry, Amy's coming too. Travel across time and space in these brand new online adventures - available free in the UK, only on this site. Can you do battle with the Daleks, survive Skaro and save the Earth? The first adventure, City of the Daleks, was posted late last week and is ready to download (HERE) and play now - unfortunately only if you are in the UK - that is unless you swim in dangerous torrent feeds and hope you don't hit an unsecure or virus-laden client. Some more details . . . The TARDIS materializes in 1963 to find the human race crushed by the Daleks. The Doctor embarks on a quest to the Dalek planet to correct time and save the last survivor of Humanity - Amy Pond! Finally - here's a vid of the promotional kick-off last month where the Daleks terrorised the area around Sheffield railway station for several hours, even managing to squeeze in a few digs at Sheffield Wednesday via voice of the Daleks, Nicholas Briggs, and his ring modulator.